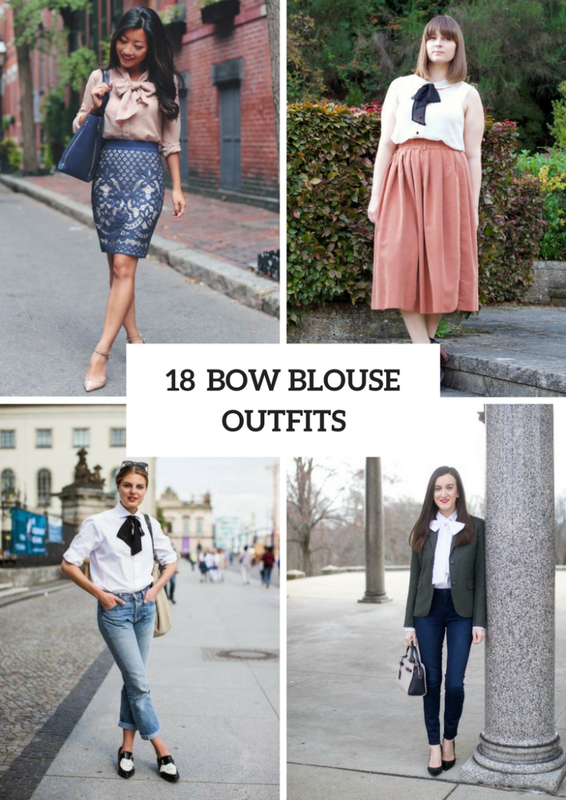 From my point of view, a bow blouse is an elegant, chic and eye-catching piece of clothes that looks good on every body shape. Depending on occasions and your favorite style you can choose any colored blouse, for example, for a cocktail party or event you can take a pastel colored (light blue, pale pink, mint green, etc.) 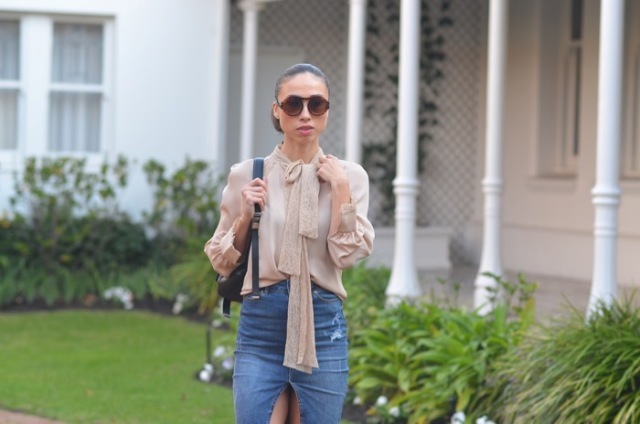 one and for creating an everyday look you can pick up a white blouse with a black bow. Of course, you can combine such shirts with jeans, trousers, skirts and even dresses, so if you wanna consider all ideas, then scroll down. If you love a black and white combination, then try to repeat an outfit with a white button dow shirt with a black bow, cuffed jeans, sunglasses, black and white flat shoes and a beige tote. Or you can take the same shirt and combine it with a black shirt, black leather skinny pants, black flat ankle boots and a black big bag. Wanna look more eye-catching and fashionable? Then try to mix a polka dot blouse with a black bow, a blue checked jacket, a brown leather bag, cuffed jeans and golden ankle boots together. Or pair a checked blouse with purple or marsala high-waisted trousers, a gray chain strap bag and high heels. Looking for elegant and more official outfit ideas? Then take a pale pink bow blouse and combine it with a printed pencil skirt, a blue leather tote and beige ankle strap pumps. Or pair a white blouse with a red high-waisted mini skirt, white tights, black high boots, a mini clutch and a black coat. For more girlish and flirty looks you can mix a white bell sleeved blouse with a brown suede mini skirt and black lace up pumps.